PORTLAND, OR, 10/16/2018 — Image Comics is proud to release a special limited edition slipcase for BARRIER, Brian K. Vaughan and Marcos Martin’s acclaimed science fiction miniseries, this March. To celebrate serialized comic books (and the awesome stores that sell them! 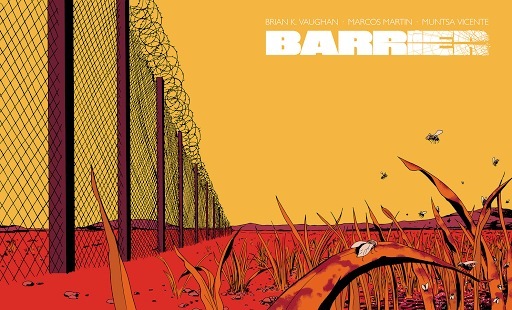 ), Brian K. Vaughan and Marcos Martin have no plans to ever release a collected edition of their Eisner-nominated miniseries BARRIER. But for everyone looking for a way to store or display all five original issues, look no further than this gorgeous new slipcase—the perfect home for the unconventional sci-fi drama about violence, language, and illegal immigration. BARRIER LIMITED EDITION SLIPCASE SET (Diamond code: NOV180090) and BARRIER LIMITED EDITION SLIPCASE (EMPTY) (Diamond code: NOV180091) will be available on Wednesday, March 27th. The final order cutoff deadline for comics retailers is Monday, December 3rd.